Loi Krathong is an ancient annual celebration in Thailand that takes place on the evening of the twelfth full moon in the traditional Thai lunar calendar. In the west, this usually falls in November. 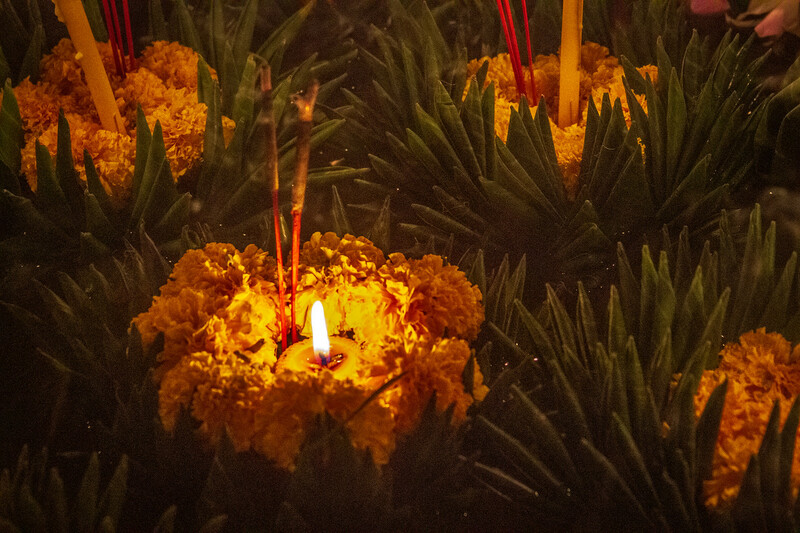 When I fortuitously arrived in Chiang Mai in November I was told repeatedly by locals and travelers alike that my timing was fortunate in that I would be able to celebrate Loi Krathong; bring good luck to myself and wash away my worries. Since you can never have too much good luck and the thought of reducing my worries even further was, of course, appealing, I was psyched. It turns out with good reason; Chiang Mai is ground zero of the celebration and just being about to observe the pageantry was a blessing. Before I arrived in Asia, I had read a bit about the festivities but didn’t realize how big and beautiful this event is. Participants build (or purchase) small lotus flower shaped boats, called krathongs, and float (Loi) them on waterways, primarily in Mae Ping river when in Chiang Mai. The krathongs are traditionally constructed out of banana leaves but in more recent years these tiny boats have been constructed out of bread (biodegradable) or unfortunately, Styrofoam (not biodegradable, a practice which is beginning to be looked down upon and in some cases banned). Upon the boats are placed all manner of things including flowers, incense, coins, and candles; with which to venerate the Buddha. 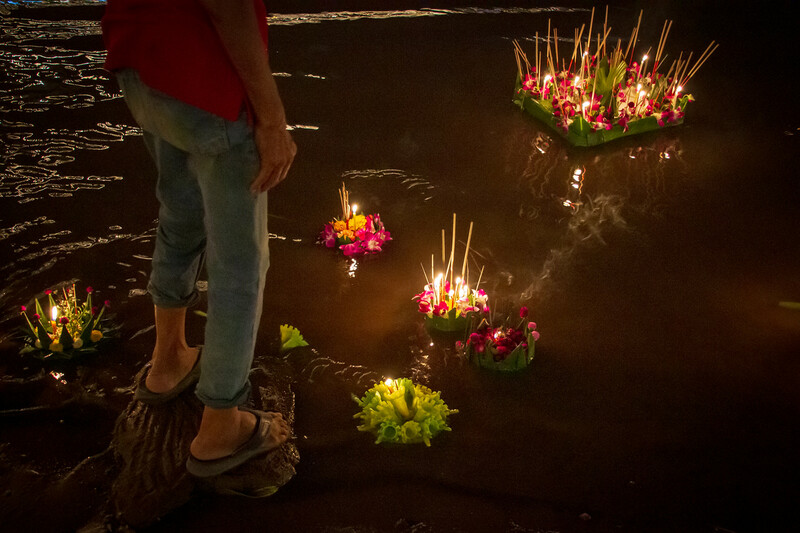 You say a little prayer, carefully place the Krathong in the water and reflect upon your life and watch as your troubles float away. It was beautiful watching people perform such a simple act with this much joy and reverence. I am not one to put a lot of faith in the metaphysical aspects of things such as this but the very act of reflection can, in my opinion, bring good things. I know some kids downstream got immediate satisfaction in that they were gathering the krathongs as they slipped out of sight and collecting the offerings. In this way, at the very least, good luck was brought to some. Great job on framing it and really dig the intimacy of the composition. Wow! Amazing photos. Your post will be very useful to me in the next trip to Thailand. Thanks for sharing with us and love to hear more.